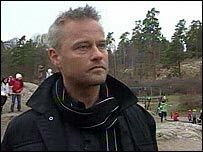 When Daniel Lundquist and his wife Ulrika moved to Ingaro, 30 minutes' drive east of Sweden's capital Stockholm, they immediately started looking for schools for their three young children. Like many British parents they worried that the local state schools were either too far away or not quite what they wanted. However, rather than complaining or simply going private, the Lundquists decided on a route currently not available to most British parents - they actually set up a brand new state school themselves with other local parents and helped run it just how they liked. That was 12 years ago and since then the Lemshaga School has grown from a tiny 80-pupil primary school to a thriving state-funded comprehensive with 420 pupils aged from three to 16 and an international reputation. 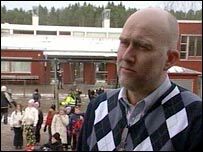 The school's creation was made possible by Sweden's radical school choice policy introduced in 1992, which allows pretty much anyone, a private company, charity, co-operative or voluntary group, to found a school and receive state funding. The so-called "free schools" have to meet basic standards, follow a core curriculum and promote democratic values. But money follows the student so if the schools attract enough pupils then they survive and the better ones thrive. Since the policy was introduced 15 years ago the number of independent schools has exploded. Now 8% of primary pupils and 15% of secondary pupils attend such schools, and the number is still rising fast. While there was initial opposition to the idea of competition in state education that seems to have faded to be replaced by broad support. The Conservatives believe a similar scheme in England could create 220,000 new school places over the next nine years. "Not just competition but diversity are the reasons for the policy's success," says Anna-lena Bengtsson, the principal of Lemshaga school. "This school was founded on a vision and because we are a free school we have the freedom to go all the way with our vision and decide what we want to be. "But money follows the child so if other state schools get better results then parents will go there instead." Surrounded by lakes and woods, Lemshaga is certainly unique. 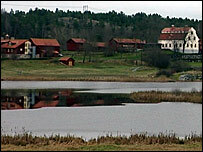 It was converted from a 17th Century farm with the barns becoming the classrooms. Yet it is firmly in the modern age with every pupil having a laptop and its teachers trying to pioneer a new educational approach. Its slogan used to be "chickens and computers": students are encouraged to work independently and actively find out information rather than learn passively. 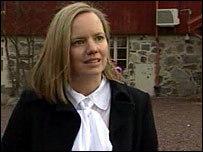 This super-liberal style may not be exactly what British Conservatives have in mind but it is popular with Swedes. The school is so over-subscribed parents put their children on the waiting list at birth. But the popularity of Swedish free schools is also the problem with them. As local councils cannot block a school if approved by the government, then there is sometimes intense competition with existing state schools. If they lose pupils to free schools, they lose money - which can harm the education they provide and ultimately force their closure. Just down the road from Lemshaga is its main competitor, Brunn School. The head teacher, Goran Lovgren, says: "The impact of free schools has been better quality - competition has kept us on our toes." 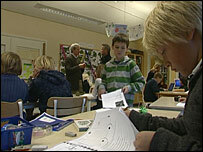 However he also admits he is facing falling pupil numbers and has had to merge classes resulting in bigger class sizes. "The danger is that I don't get enough pupils so I can't do a good job because we don't have enough money." There is a delicate balance and a risk he feels that free schools could upset the ecology of the education system and end up harming pupils unless there are strong controls. The Conservatives argue that their version of the Swedish system will "raise the bar and close the gap" by shifting the balance of power away from local authorities and towards parents. Unfortunately there has been no reliable research on the overall impact of the policy in Sweden. While it has proved popular with parents and generated new schools and innovative ideas, there are also claims that it has been educationally disruptive and socially divisive. There is one big difference between the Conservative proposal and the Swedish system - profit will not be permitted. 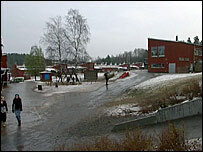 Many of the Swedish free schools are run by private for-profit companies rather than charities. That raises the question of whether the Tories will be able to find enough philanthropists or parents with time on their hands to generate what they hope will be a "supply-side revolution in education".